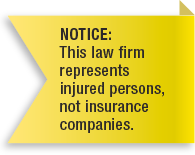 At Henry Law Firm, PLC, we represent injured persons; we DO NOT represent insurance companies or large corporations. With 50 to 60 years of law experience, we focus exclusively on personal injuries and deaths resulting from automobile and tractor-trailer accidents, physician and hospital malpractice and defective drugs and products. We also have decades of family law experience in the areas of divorce, custody, child support, adoption and guardianship. If you're looking for personal injury lawyers or family law attorneys that will put you first, Henry Law Firm is where you need to be. We are the family law and personal injury lawyers who promise that personalized, prompt attention is given to every case. Every client is important to our firm and is treated accordingly. Going beyond other standard divorce lawyers and personal injury attorneys, ability, experience, direct accountability, and willingness to work are the components of effective legal representation. Our goal is to provide the best consultation and representation that each of our highly skilled attorneys in family law and insurance can to each of our clients. We look forward to proving that these are not mere words; that both you and we will derive mutual satisfaction from the attorney services we render to you. We have offices in both Fayetteville and Jonesboro and we represent clients all over the State of Arkansas in personal injury, car accident, divorce and custody cases. If aggressive negotiation does not result in settlement of your case, we are prepared to take your case to trial and utilize the best experts in the fields of medicine and accident reconstruction to obtain an outstanding result for you. If it is a family law matter that you need representation for, we can help you through the difficult time and fight for what you are legally entitled. All fees to Henry Law Firm, PLC for personal injury cases are on a contingent fee basis. A contingency fee allows injured persons to obtain experienced, competent legal help from an attorney without charge for legal services if the case is not successful. Only out-of-pocket costs, if any, need to be paid. When recovery is obtained, the attorney receives a percentage of the award. For our lawyers to be able to look out for your legal interests, Henry Law Firm, PLC must have a signed contract. This requires both you and our firm to sign a contract that specifies the Henry Law Firm, PLC is representing you on a specific legal matter. Without a mutually signed contract, this firm cannot represent you and cannot protect your rights.